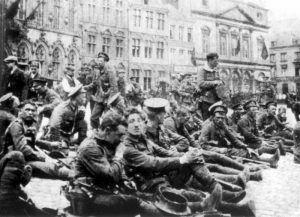 The Battle of Mons was the first engagement between the British and German forces and began on 23 August 1914. Mons was one of the so called ‘Battles of the Frontier’. The others were Mulhouse, Lorraine, the Ardennes and Charleroi. The British Expeditionary Force (BEF) began arriving in France from 10 August. The BEF’s Commander-in-Chief was Sir John French (pictured right). By nature a cautious man, he ordered his force to move inland from the French and Belgium coasts in keeping with his character. The plan was to meet up with the French Fifth Army commanded by General Lanrezac near Charleroi on the Sambre. However, before the BEF reached Charleroi, it encountered German cavalry patrols sent out from their First Army at Soignies on 22 August. Unaware of the German’s full strength and of its victories at Lorraine and the Ardennes, Sir John French immediately made plans to attack the German forces to his front. This decision also went against recent intelligence reports. Deviating from his original plan overnight, Sir John ordered his five divisions to establish defensive positions along the Mons Canal. French’s surprise at meeting the German First Army was equalled by its commander, General von Kluck (pictured left), who having just encountered and engaged General Lanrezac’s French army at the Battle of the Sambre, was intent on chasing his foe south. Having been forbidden from outflanking the British by German High Command for fear of losing contact with von Bulow’s Second Army, von Kluck decides to launch an all out frontal attack on the BEF positions on 23 August. 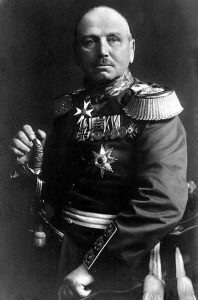 As early as 7 August, General Lanrezac, commanding the French Fifth Army, had warned Joffre, the French Commander-in-Chief, of a sizeable build-up of German strength into Belgium and so Sir John French should not have been too surprised at the sudden appearance of a large German force. This could be because Joffre appeared not to listen to Lanrezac’s warnings, perhaps because they conflicted with France’s pre-war battle strategy, Plan XVII, which assumed that Germany would not attack France via Belgium. 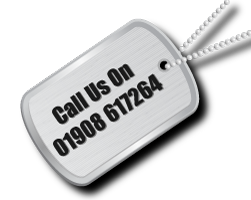 The first British-German contact had come via cavalry patrols. This had effectively bought Sir John a day’s grace before battle commenced. Using this he deployed his two infantry corps, commanded by Smith-Dorrien and Haig, respectively, east and west of Mons across a forty kilometre front. The eastern wing almost reached the retreating French Fifth Army under General Lanrezac, some eight miles away Edmund Allenby’s cavalry division was held in reserve. When the battle started the British found that they were heavily outnumbered by their German opposition. The 80,000 British troops and their 300 guns were opposed by 160,000 Germans with a total of 600 guns. Despite these odds, von Kluck’s offensive against General Smith-Dorrien’s II Corps began disastrously and the experienced British riflemen exacted heavy losses from the advancing German infantry. 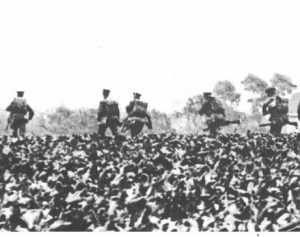 The efficiency of the British riflemen was such that von Kluck assumed that the enemy were using machine-guns and by mid-afternoon the German offensive had made no progress. Whilst von Kluck drafted in reserves, Sir John French, having heard news that General Lanrezac had retreated and could therefore offer the British no assistance, ordered a strategic retreat to the British second line of defence. The German offensive was renewed in the evening, by which time Sir John French had realised just how strong von Kluck’s forces were. With this new knowledge, French ordered Smith-Dorrien and Haig to retreat further. Von Kluck did not at first chase the retreating BEF at first. Instead he chose to address the heavy casualties that his army had taken earlier in the day. However when von Kluck did give chase he inflicted almost 8,000 casualties upon the tired British rear-guard. This rear-guard was mainly from Smith-Dorrien’s II Corps who turned to fight the German’s at Le Cateau on 26 August and deal them a stopping blow. The British Commander-in-Chief then undertook an extended retreat. 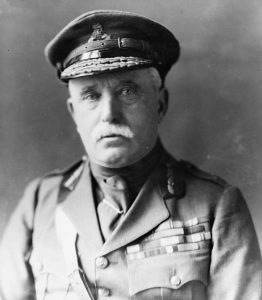 Sir John French had recommended complete withdrawal to the coast but Lord Kitchener, the British war minister, rejected French’s suggestion out of hand and ordered French to keep the BEF in contact with the French forces that were retreating to the Marne.